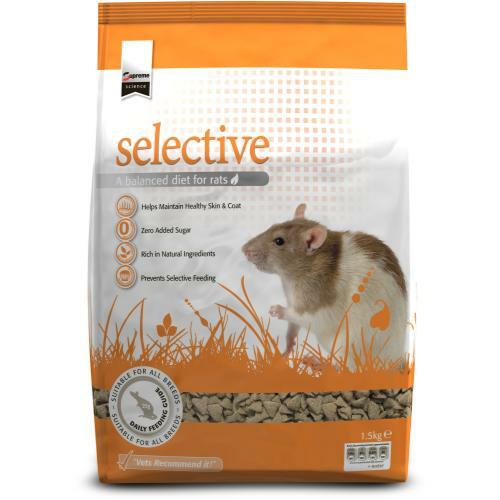 Supreme Science Selective Rat Food is a nutritionally complete and balanced diet for rats. A unique vegetarian diet that perfectly suits rats and keeps them healthy and well. It includes fruits such as apple and blackcurrant for their antioxidant properties and high vitamin content. It is also high in unsaturated fats but low in saturated fat and cholesterol to help look after little rat hearts. Soya protein gives rats all the high quality protein they need for a healthy life and nibble-tastic nature! Ingredients: Wholemeal wheat flour, soybean meal, oats, soy oil, apple (2.5%), blackcurrant (2.5%), limestone flour, salt, methionine, lysine, minerals.